An artist's illustration of UKube-1, Scotland's first satellite, in orbit. It launches in 2013. Scotland's first satellite will soon find a home in orbit around the Earth — a forerunner of things to come under a collaborative, national nanosatellite program in the United Kingdom. Dubbed UKube-1, the small, novel CubeSat spacecraft has been constructed by Clyde Space in Glasgow and is completing final testing for launch later this year onboard a Russian Soyuz-2 rocket from the Baikonur Cosmodrome in Kazakhstan. The advanced UKube-1 nanosatellite has been designed and manufactured by Clyde Space at their high-tech facility at the West of Scotland Science Park. The petite but powerful spacecraft is chock full of payloads that include the first GPS device aimed at measuring space weather in Earth's plasmasphere — the inner-most layer of the planet's magnetosphere. The satellite also comes equipped with a camera that will take pictures of the Earth from space and test the effect of radiation on space hardware using a new generation of imaging sensor and an experiment to demonstrate the feasibility of using cosmic radiation to improve the security of communications satellites and to flight test lower cost electronic systems. A recent visitor to take a look at UKube-1 was Alex Salmond, First Minister of Scotland. "It's one small satellite for Clyde and a giant leap for their extraterrestrial export business and a new hope for space science in Scotland," Salmond said. UKube-1 is a UK Space Agency mission. The mission has been funded jointly by Clyde Space and a number of funding partners including the UK Space Agency, the Science and Technology Facilities Council, the Technology Strategy Board and Scottish Enterprise. Clyde Space scientists, the proud parents of Scotland’s first satellite, UKube-1, pose with the small spacecraft, which is set to launch in 2013. As well as the platform and payload elements of the mission, UKube-1 is being supported by three UK ground stations. "We started designing our nanosatellite platform in 2008 as a means to stimulate some funding from the UK government as part of a national CubeSat program," Craig Clark, chief executive officer of Clyde Space said. Nanosatellites are the fasting growing space sub-sector, with the UK able to tap into both heritage and expertise that primes the pump in building future small satellites, Clark added. 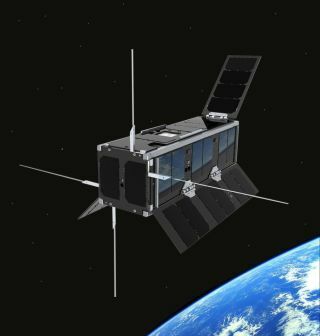 Clark told SPACE.com that there are a number of new developments from Clyde Space on the mission including deployable solar panels — there are three on UKube-1 — as well as advanced attitude and control technology, a sophisticated miniature sun sensor and specialized software that other CubeSats can use. There's value in "starting small" as there are many factors that go in to working on a nanosatellite, Clark said. Clark said that many larger space organizations still look down their noses at nanosatellites as being toys. "But the fact of the matter is that they are staying away from them because they can’t see a business case for themselves in producing CubeSats. Let's face it, a space company with a turn-over of over $1 billion isn't going to be interested in a full mission sale of less than $500,000 … it would be too much risk for them." This is good news for small space companies, Clark said, as they are able to innovate more and are rapidly increasing the utility value of CubeSats. So much so that major space users are now looking to CubeSats and nanosatellites to fill gaps in capturing wanted and valuable data, he said. "The big difference in cost and technical skill when it comes to CubeSats over larger missions is the availability of off-the-shelf subsystems that can be used," Clark said. Clyde Space has invested significant dollars into UKube-1 as part of their product development strategy, Clark said. "Our reason for doing this is because we wanted to develop an advanced CubeSat platform that we can then market as a full mission capability for organizations that want to put payloads into space but don't want to have to worry about the satellite itself," Clark said. It's a growing competitive market, with agencies, military and commercial customers hungry to have an active role in space, Clark said. The bottom line, he added: “Anyone who puts a satellite into space wants to give the mission the best chance of success. If we are successful in our business plan, UKube-1 will be the first of many more Scottish satellites." "Anyone who puts a satellite into space wants to give the mission the best chance of success," Clark added. "If we are successful in our business plan, UKube-1 will be the first of many more Scottish satellites." Leonard David has been reporting on the space industry for more than five decades. He is former director of research for the National Commission on Space and co-author of Buzz Aldrin's new book, "Mission to Mars – My Vision for Space Exploration," out in May from National Geographic. Follow us @Spacedotcom, Facebook and Google+. Original article on SPACE.com.